Human Fetuin-A (also known as α2-HS-glycoprotein) is a plasma protein synthesized by the liver and secreted into the serum. It plays a role as a physiological inhibitor of insulin receptor tyrosine kinase associated with insulin resistance. It is a negative acute-phase reactant involved in the inflammation processes. High serum concentrations have been observed in patients with fat accumulation in the liver, which is related to obesity, metabolic syndrome, and to an increased risk of type-2 diabetes. Therefore, it is considered as a candidate biomarker of these diseases. Fetuin-A (HFA) has also been proposed to be a potential biomarker for pancreatic and liver cancers and in metastasis of tumor cells as well as to differentiate prostate cancer and benign prostatic hyperplasia. HFA is a potent inhibitor of the calcium-phosphate precipitation and of the calcification process. It can also be related to dental calculus, which is the first response in the inflammation of tooth supportive tissues. It is also important to remark that, although serum is the sample most frequently analyzed in fetuin-A tests, other biological fluids, such as saliva, holds great promises in POC analysis, mainly due to the economic and non-invasive way of sampling when compared to the extraction of other types of samples, for example, blood, liquid cerebrospinal fluid, or biopsies. 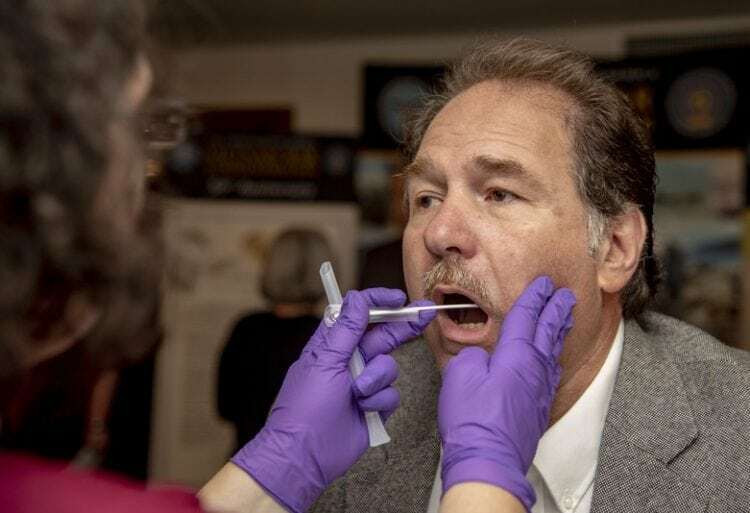 Effectively, the salivary fluid can be easily and painlessly collected by either patients or healthcare personnel and requires no use of needles, thus reducing the probability of blood-borne infections and enhancing patient compliance. One drawback to note is that, usually, levels of biomarkers in saliva are considerably lower than those in other biological samples. Healthy patients’ Fetuin-A serum levels are around 50 µg/mL. However, in saliva, the levels are a thousand times lower than in serum. Therefore, very sensitive analytical methods are needed to carry out its determination. The common test for the HFA determination is an enzyme-linked immunosorbent assay (ELISA) with optical detection. Detection of HFA marker using immunosensors are an excellent and reliable alternative to ELISA tests, which normally are more expensive, require associated equipment, and more time to be completed. In this work, a film of aminobenzoic acid was grafted onto the carbon working electrode surface. Then, the activation of the carboxylic groups with the carbodiimide system and covalent binding of streptavidin took place. Finally, the biotinilated antibody was captured on this streptavidin-modified electrode surface. In addition, carbon nanomaterials, which have a large surface area, biological compatibility, and possibility of easy functionalization, are excellent substrates for biomolecules immobilization as well as carriers for loading signal elements, such as enzymes, oligonucleotides or antibodies. A sandwich assay configuration was reported using m-MWCNTs as carrier nanotags for signal amplification. Specifically, the mMWCNTs conjugated with HRP and antibody, prepared in our lab, was employed as a detection label. These sandwich immune complexes are formed on disposable electrodes are similar to those used by diabetics and provide an amperometric response proportional to the concentration of HFA in the sample. The immunosensor exhibits an excellent analytical performance in terms of sensitivity, clinically relevant linear range, reproducibility, storage stability, and selectivity. This signal amplification strategy allows the achievement of a high sensitivity as it is required at the expected saliva concentrations. 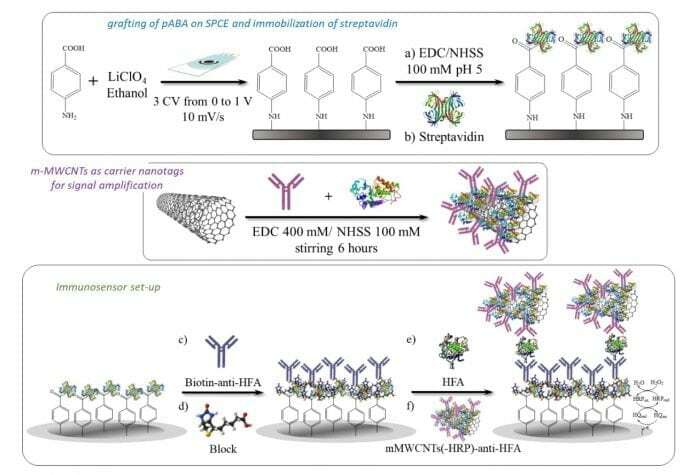 Moreover, if the anti-HFA-Biotin-Strept-Phe-SPCE immunosensor and m-MWCNTs used as carrier nanotags have previously been storaged, the determination of fetuin-A can be carried out in only 2 hours. In addition, saliva is increasingly recognized as an attractive fluid for diagnostics since it allows a non-invasive cost-efficient sample collection method among other advantages. The developed immunosensor was applied to the determination of fetuin-A at the required concentration levels in saliva with minimal sample treatment (only a dilution). We demonstrated that the determination of HFA in saliva could be performed directly by interpolation of the amperometric current measurement for the sample into the calibration plot constructed with standard solutions. The results obtained in saliva were compared to those provided by a commercial spectrophotometric ELISA kit for the quantification of HFA in saliva samples, obtaining an excellent correlation. This immunosensing strategy can be easily extended to the electrochemical determination of other biomarkers since the disposable electrode surface modification protocol and the use of magnetic multiwalled carbon nanotubes as nanocarrier tags can be viewed as general working approaches to design other electrochemical immunoplatforms which enhanced performance with respect to conventional methods for the determination of proteins that are important marker parameters of different diseases in biological samples of different nature and complexity. These findings are described in the article entitled Magnetic multiwalled carbon nanotubes as nanocarrier tags for sensitive determination of fetuin in saliva, recently published in the journal Biosensors and Bioelectronics. This work was conducted by Esther Sánchez-Tirado, Araceli González-Cortés, Paloma Yáñez-Sedeño, and José M. Pingarrón from the University Complutense of Madrid. Araceli is a professor at the Complutense University of Madrid in the Department of Analytical Chemistry. Previous Post« Previous How Does The Brain Manage Everyday Memory Events?